Installed a free hidden statcounter code to track hits to the site. 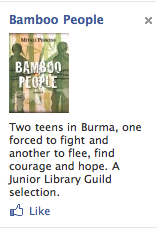 Set up a page for Bamboo People on Facebook. Currently playing with an ad on Facebook with a $2/day limit, targeting people who live in the UK and the USA who "like" Aung San Suu Kyi, Burma, Burma Campaign UK, Daw Aung Aan Suu Kyi, Myanmar, Refugee, Refugees, or US Campaign for Burma. I set my pay per click (vs. view) at $.65, within the parameters suggested by Facebook, and linked the ad to my bamboopeople.org website. My click-through rate has been outstanding, and the ad has shown up over 500,000 times in April and May, even with me putting it on pause for days to save money. The week before and after launch, I plan to increase the daily spending limit, add more keywords, and keep an eye on my click-throughs. I plan to spend $100-$150 total for this venture, including the registration of the domain name. Anyone else tried a book-related ad on Facebook? What's your experience or advice?